Japanese “lawless adventurers” were utilized by 19th Century Meiji Japan as agents of expansionism. 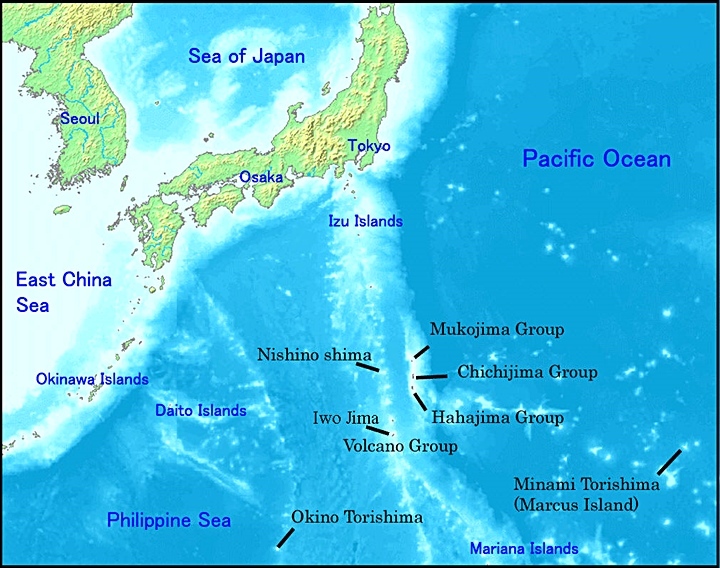 Minamitori-shima (南鳥島) or Marcus Island is an isolated island in the northwestern Pacific Ocean, located at 24.18’N, 153.58’E. The Japanese meaning of the name is “Southern Bird Island”. It is 1.2 kms in area. It is the easternmost territory belonging to Japan, some 1 848 km SE of Tokyo, or 1 267 East of the closest Japanese island, South Iwo Jima of the Ogasawara Islands, and nearly on a straight line between Tokyo and Wake Island, which is 1 415 km ESE. 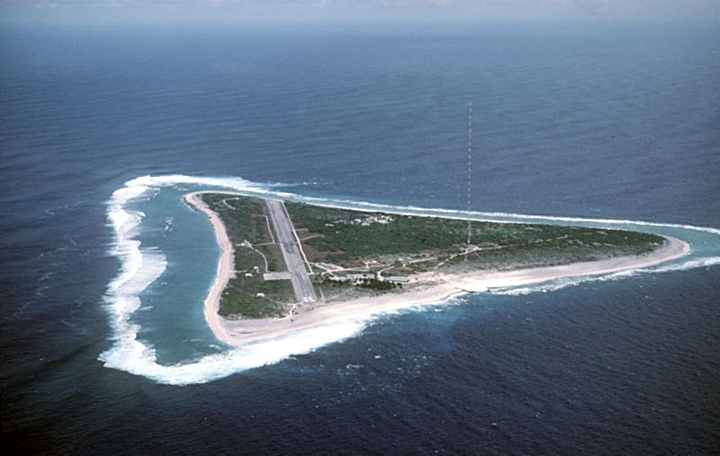 The closest island, however, is Farallon de Pajaros of the Mariana Islands, which is 1021 km WSW of Minamitori Shima. The island is first mentioned in 1864, given a position by a US survey ship in 1874, and first landed on by Kiozaemon Saito in 1879. 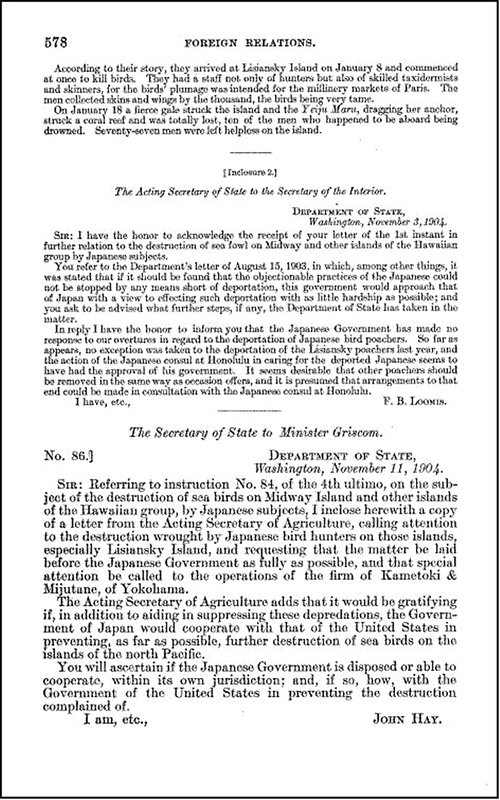 Japan officially annexed the island July 24, 1898, the US claim from 1889 according to the Guano Islands Act being not officially acknowledged. 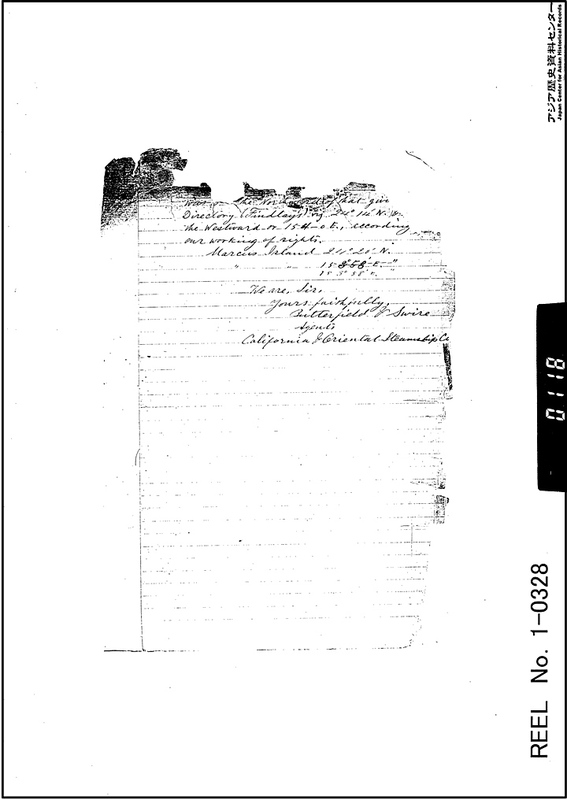 How is Japan’s 1898 annexation of Marcus Island related to the Dokdo~Takeshima dispute? 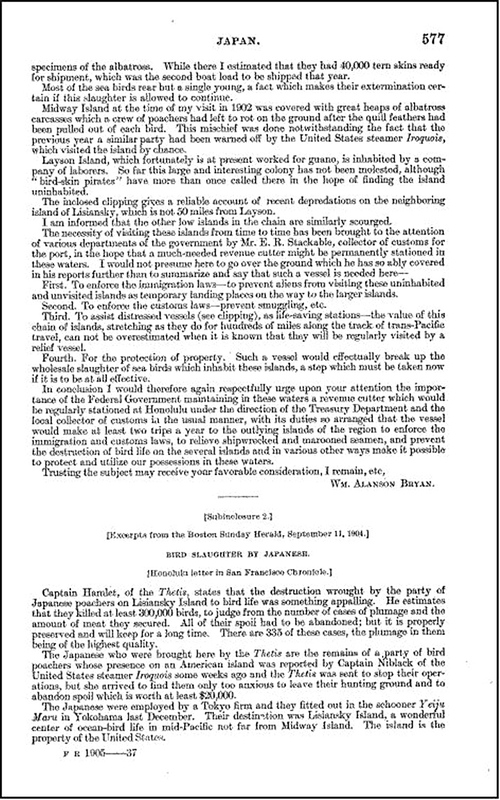 Koreans assert Japan’s 1905 incorporation of Liancourt Rocks (Takeshima) was seriously flawed because Japan failed to announce her intent in an “open and public manner”. 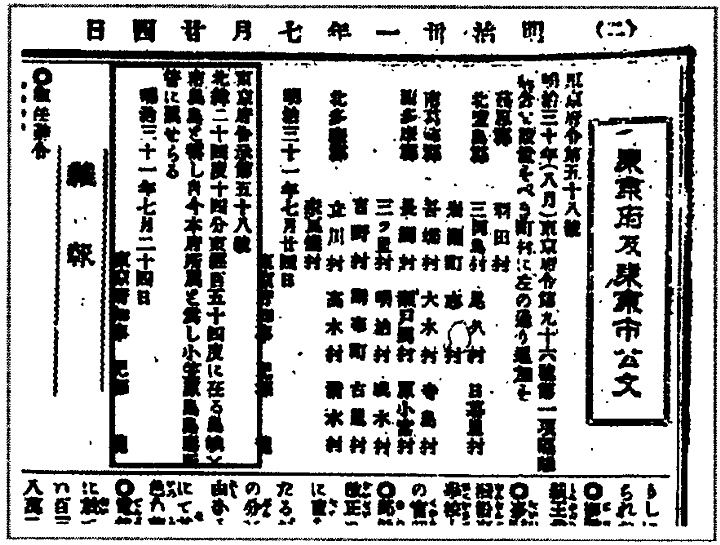 Indeed records show the only public notice given during Shimane Prefecture’s annexation of Takeshima was a tiny ad in a local newspaper. 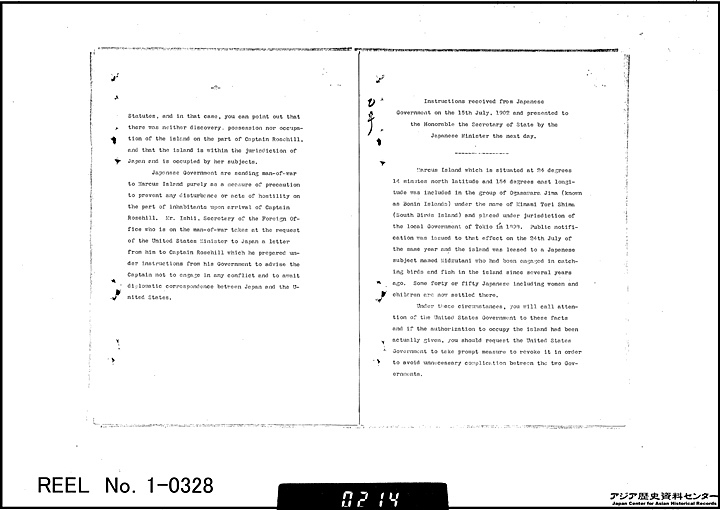 On the other hand, when Japan decided to claim the Bonin Islands (Ogasawaras) both the U.S. and Britian were notified numerous times, though they were remotely involved in the islands. 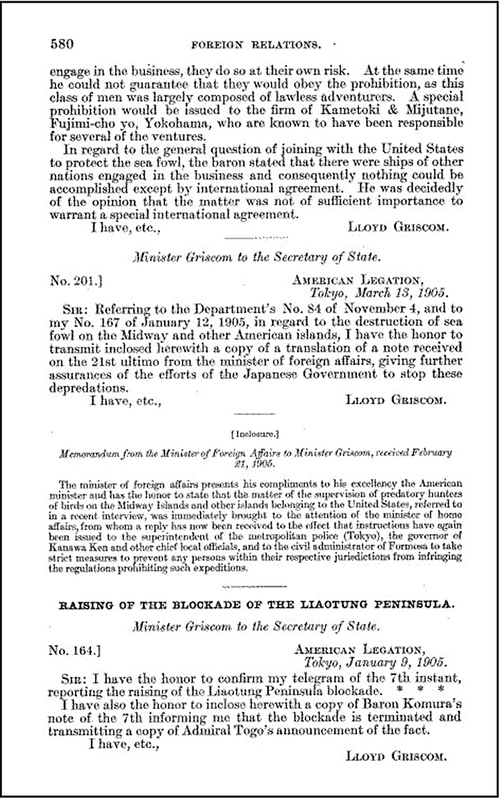 Japan’s MOFA states that her annexation of Liancourt Rocks was identical to her incorporation of Marcus island and thus both were legal. On this matter the Japanese seem to be correct. Purely from a legal standpoint Japan’s incorporation of Marcus Island is comparable to Dokdo. However, does this fact help to support Japan’s argument in the Dokdo – Takeshima problem? 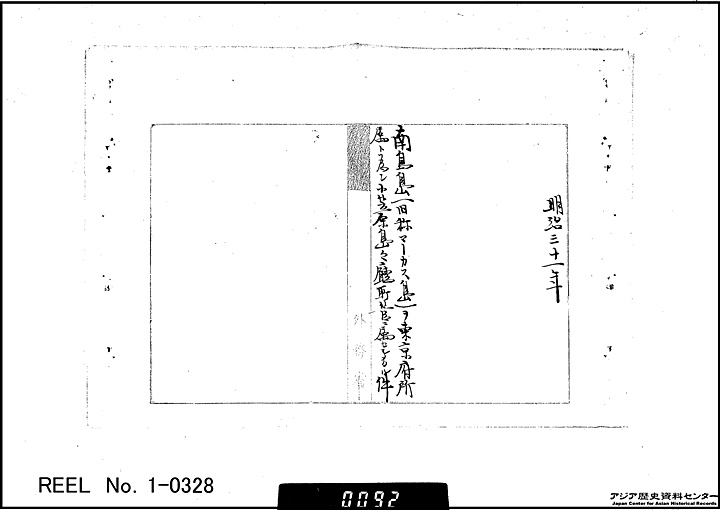 Through the study of old historical records from Japan’s National Archives this page points out some flaws in Japan’s Marcus Island claim and how they relate to Dokdo – Takeshima. 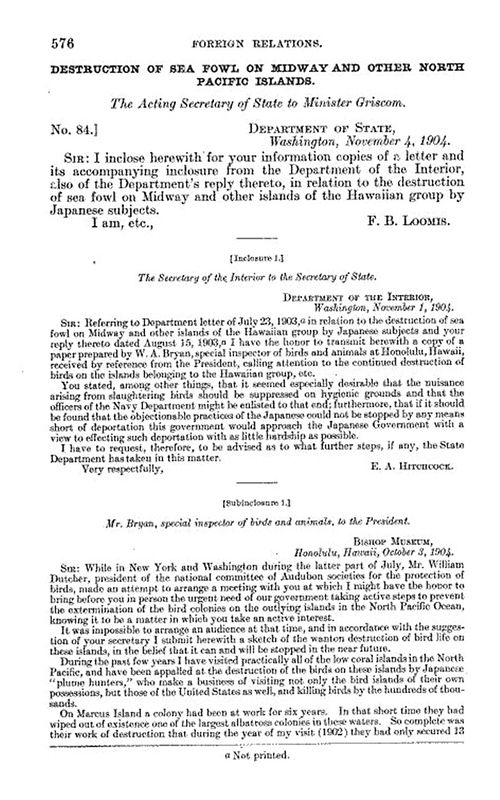 The Origin of the Marcus Island Dispute of 1902 Between the U.S. and Japan. 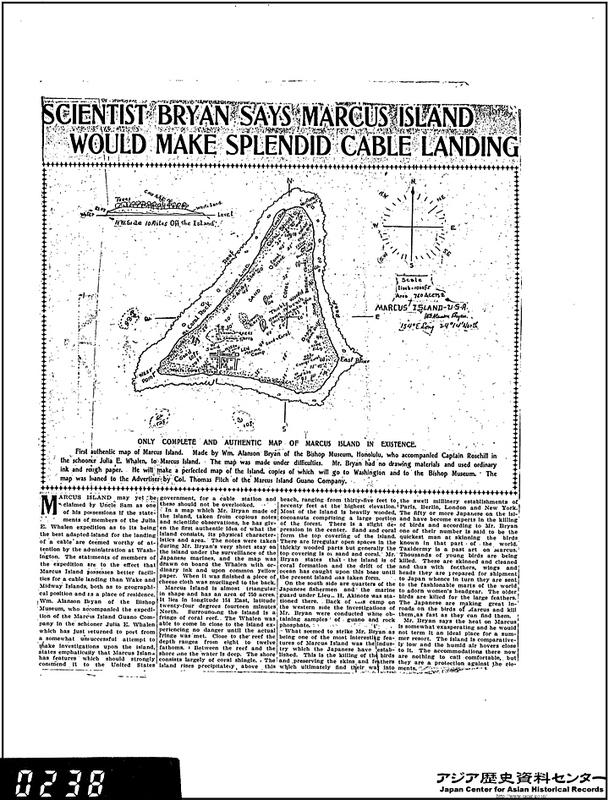 In 1889 a small trader named Captain James Rosehill happened upon Marcus Island. He hoped to utilize the island for coconuts however he soon realized it had vast guano (bird feces) deposits that could be sold for fertilizer in Hawaii. Captain Rosehill then hoisted the American flag atop a coconut tree. From there Captain Rosehill fastened a bottle to a tree in which was a note that he had taken formal possession of the island in the name of the United States. Rosehill’s crew signed the note to witness the event. Captian Rosehill failed to push through his application to incorporate the island and in the meantime the Japanese claimed Marcus Island as part of the Ogasawara Islands group in 1898. 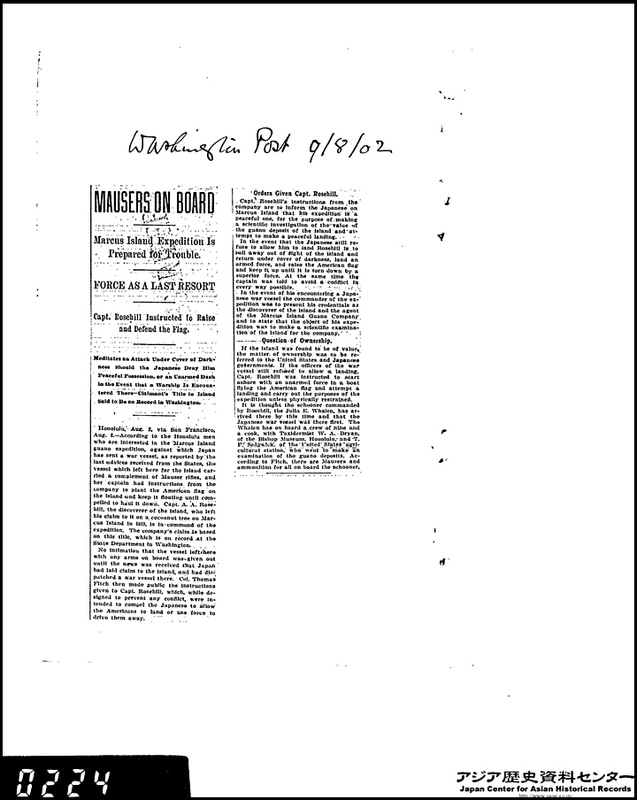 In 1902 when Rosehill finally decided to persue his activities on Marcus Island further, the result was a diplomatic row between the United States and Japan. The dispute that followed almost lead to a military showdown between the two nations. 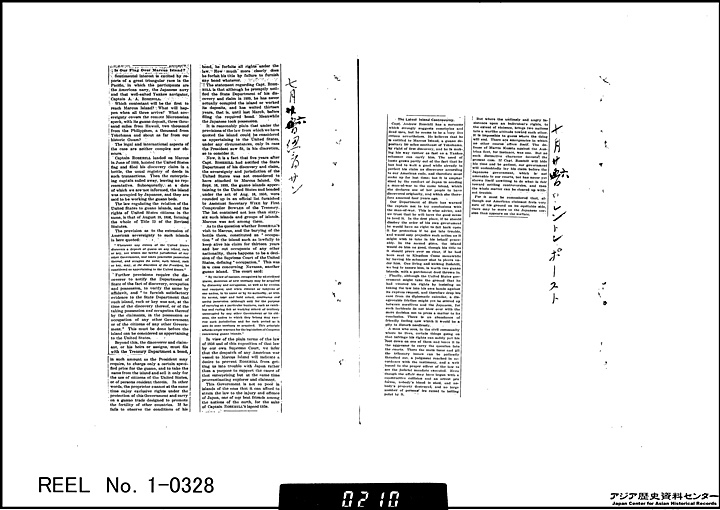 The purpose of the page is not to argue who had superior title but rather a close look at Japan’s land claim legal practices. 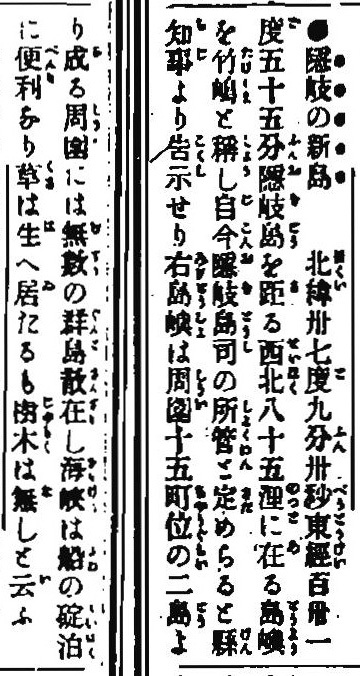 The two Japanese news articles found here are what amounted to Japan’s public announcent when she acquired Marcus Island in 1898. 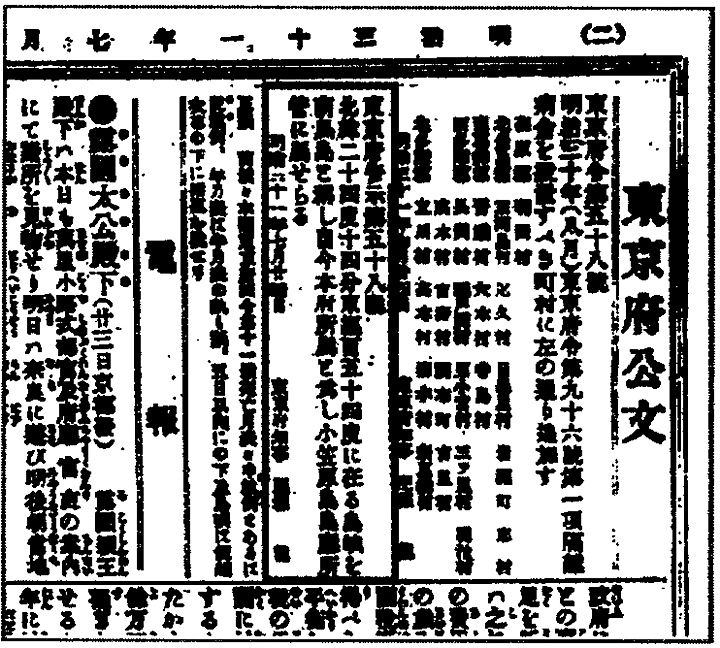 Next to them are Japan’s newspaper article when she annexed Takeshima in 1905. One can see that they are almost identical. Were the following “declarations” sufficient to be classified as “open and public” as territorial land claims must be? Four years after Japan laid claim to Marcus Island, Captain Rosehill and the American Government also attempted to annex Marcus Island. 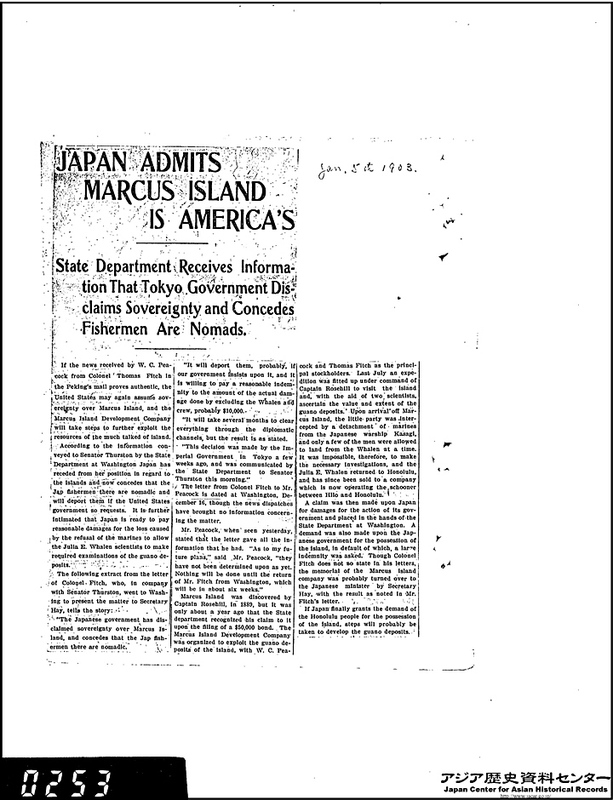 Obviously the U.S. Government was not aware Japan had incorporated Marcus Island many years earlier and this shows Japan’s “public announcement” was insufficient. 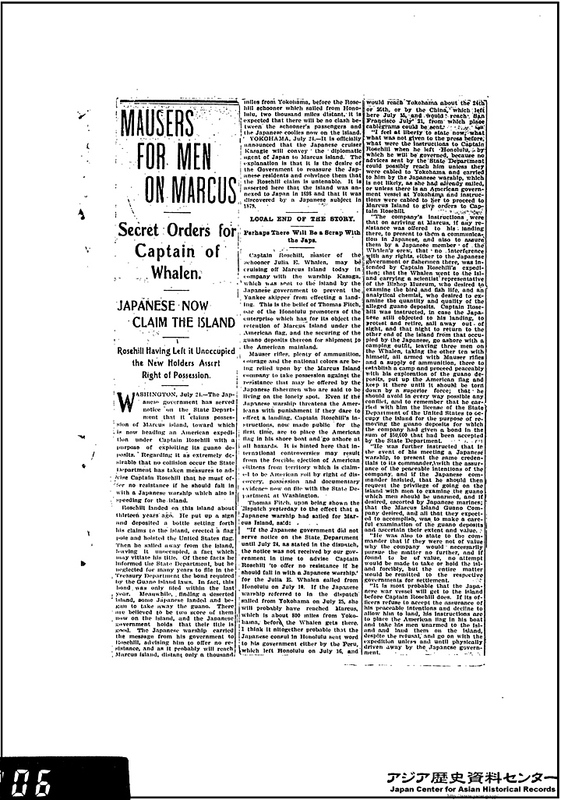 Japan’s inadequate publicity of Marcus Island’s claim caused a diplomatic row between the nations which almost erupted into a military conflict. Japan’s Minister of Foreign Affairs, Baron Jutaro Komura (shown right) was involved in both the Marcus Island dispute and the incorporation of Takeshima. Knowing this, why didn’t Japan’s Foreign Affairs Office change their procedure in 1905 to prevent another international conflict? 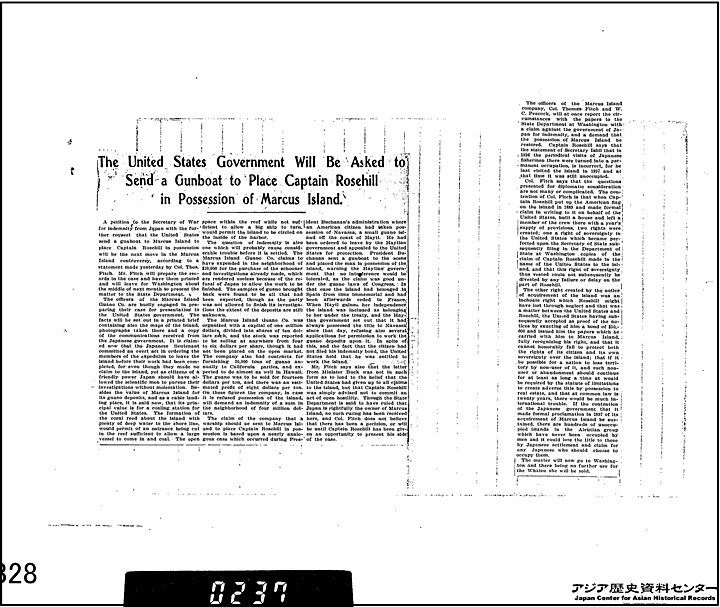 Why was Takeshima’s “public announcement” done in the same stealthy manner as Marcus Island? 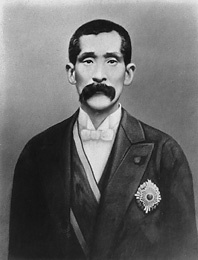 Nakai Yozaburo and Mijutane, Japan’s MOFA utilized poachers for 19th Century land claims. 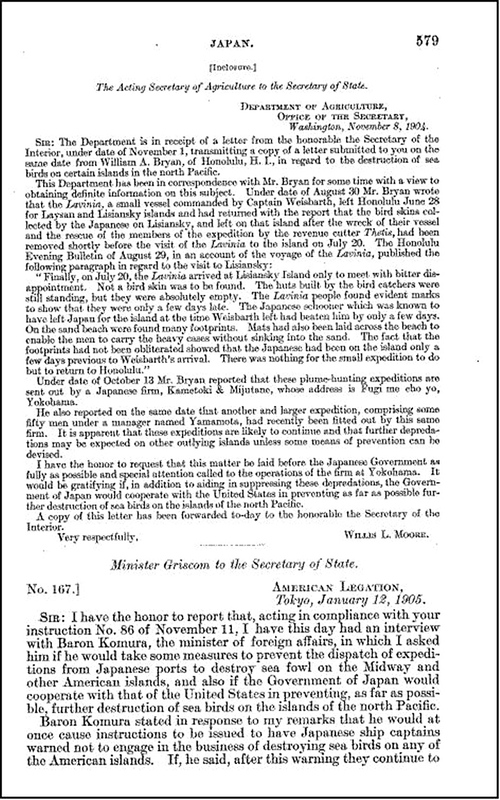 During the 1902 Marcus Island disagreement of 1902 Japan’s Foriegn Affairs Office cited the activities of bird hunters for proof of title. 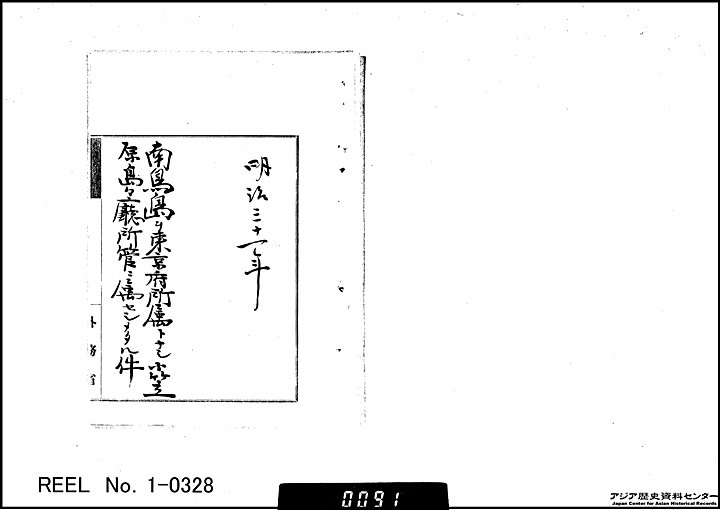 This is shown in Komura Jutaro’s letter during the 1902 Marcus Island dispute. Komura stated, “…The island (Marcus) was leased to a Japanese subject named Mijutane who had been engaged in bird hunting and fishing on the island…” Komura also falsely claimed around twenty Japanese were settled on Marcus Island. Around mid-1903, the shocking truth about these Japanese poachers in the Pacific finally came to the attention of the National Audubon Society and the U.S. Government. 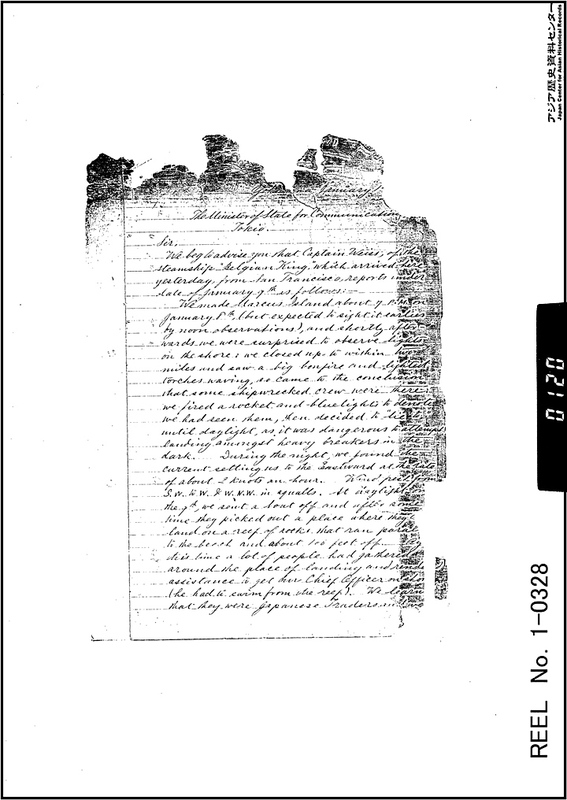 The resulting correspondence revealed the serious environmental damage caused by Mijutane’s company. What also became clear was the total disregard for territorial boundaries by these criminals. In other words, Japan’s title to Marcus Island (much like Takeshima~Dokdo) was acquired in the process of Japanese citizens unlawfully poaching marine resources from her neighbours. This situation mirrors Korea’s dilemma in the Ulleungdo region where literally hundreds of Japanese squatters overwhelmed the island to the point that Japanese police had to be stationed there. In much the same manner, when Japan annexed Marcus Island it was stated that the island was settled continuously and permanently by around twenty Japanese citizens. (link)Did Japan really have permanent residents living on Marcus Island as Komura Jutaro stated? A few records from the turn of the 20th Century reveal the truth. 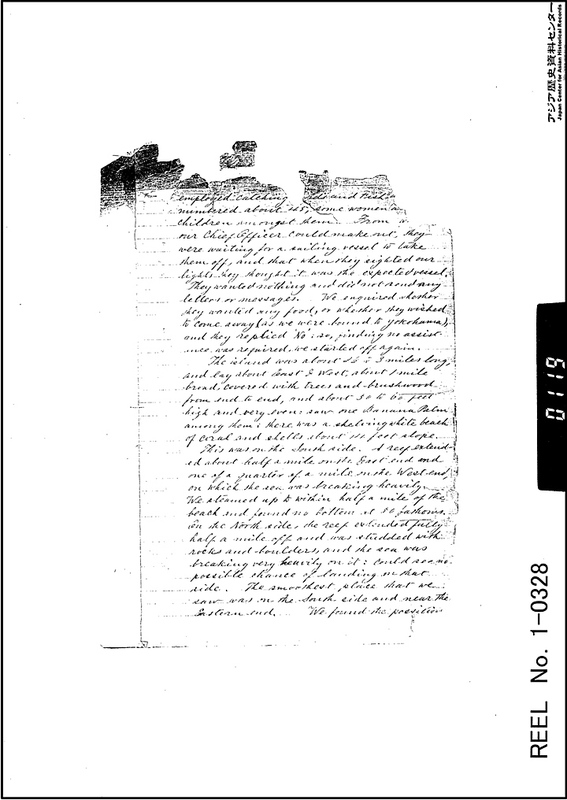 The first record was a hand-written accord by Captain Rosehill himself. How he describes the Japanese on Marcus Island shows they were anything but residents. Rosehill writes “…They were Japanese traders and were engaged in catching birds and fish and numbered about 45 some women and children amongst them. From what our Chief Officer could make out they were waiting for a sailing vessel to take them off, and that when they sighted our lights, they thought it was the expected vessel…” (link) These people were of course the same crew employed by Mijutane of Yokahama responsible for killing birds on other Pacfic islands, not permanent citizens of Marcus Island. Above images. Captain Rosehill describes his voyage to Marcus Island. Rosehill stated the Japanese on the island were not permanent residents but rather migrant bird hunters and fishermen. 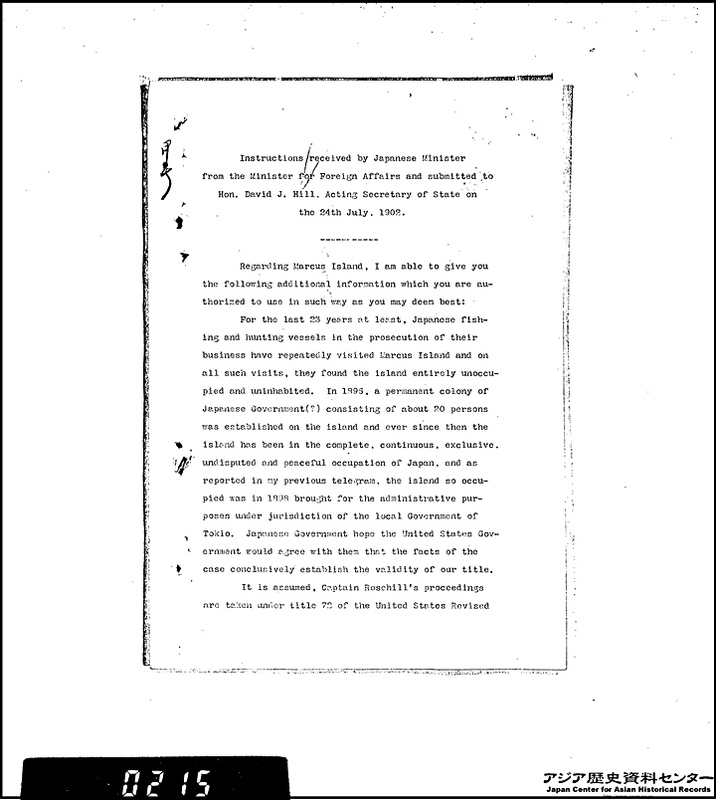 The image on the above right is a press release that records news that Japan admitted Marcus Island’s inhabitants were not settlers but nomadic. When we look closely at Japan’s land acquisitions of the 19th Century, a definite pattern emerges. Initially Japanese encroachment started with trespassing by an adventurous few who brazenly disregarded the territorial boundaries of Japan’s neighbours. From there often came a mass of settlers who would overwhelm the indigenous peoples. This would lead to a displacement of the original inhabitants or as on Korea’s Ulleungdo a gradual overwhelming of the native population. These criminals gave the Japanese government a win~win situation. They could use the trespassers’ activities as a means to incorporate territory and at the same time “wash their hands clean” of their violations by saying these lawbreakers had nothing to do with the Japanese government. This was clearly displayed by Komura Jutaro’s slick double-talk uncovered by cross-referencing two different foreign affairs records. To refer to the individuals used a basis for land title as a “lawless adventurers” speaks volumes about the legitimacy of Japan’s land claim practices. Perhaps under the colonial era laws of land claim these acquisitions could be viewed as legitimate. However Japan’s Ministry of Foreign Affairs is very misguided to think they can turn back the hands of time and reclaim Takeshima using the political circumstances in Korea/Asia in 1905 as a premise.